New Direction Christian Academy celebrated its first graduation/promotion ceremony on Thursday, June 15. The keynote speaker for the event was Richmond native Devin Lars, CEO of Kurieo Media. 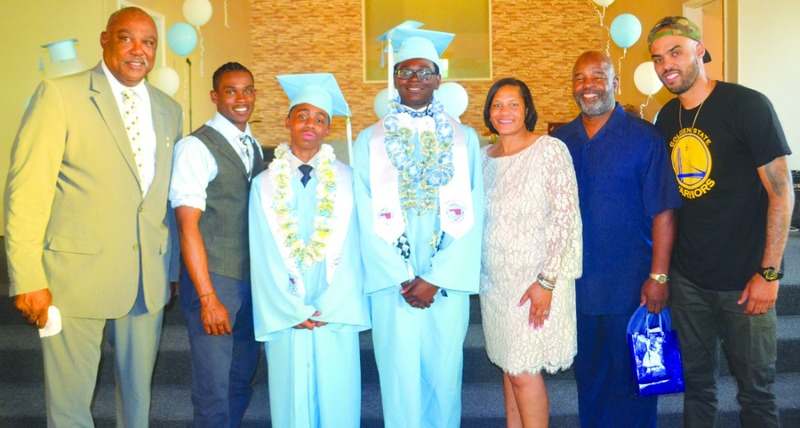 Graduates Tyree Hayes and Demar Lott made history as the very first graduates of the newly formed New Direction Christian Academy. They had both been students since kindergarten at Vista Christian School, which closed unexpectedly last June after educating children in the Richmond community for 40 years. This unexpected closing left parents in a quandary as to what they were going to do with their children for the next school year. Pastors Donnell and Christine Jones, who had two children at Vista and whose church New Direction Ministries was also housed at Vista Christian School, began to have conversations around starting their own school in an attempt to keep the Vista family together. They called Vista teachers and parents to share their vision and held an initial meeting around organizing a school. Many families attended the meetings, but it was a tough sale. It seemed impossible to be able to open a school for the fall being that it was already mid-July. Most of the parents decided to go to other places, but there were a few who took a step of faith and joined Pastor and Mrs. Jones. The parents of these two graduates and a few other families came together in faith, and New Direction Christian Academy was born. “It took a lot of prayer, pain, and hard work,” says Mrs. Jones, who says she was at the computer day and night during the summer of 2016 researching what it took to start a private Christian school.